The Avon Schools Athletic Association is the body responsible for the advancement of schools athletics within the four unitary authorities that made up the old county of Avon. Prior to 1974 schools athletics within the Greater Bristol area was split between the County Schools Associations of Somerset and Gloucestershire, the defining boundary being the River Avon. When the County of Avon was formed in 1974 as a result of the governmental changes to county boundaries the new County Schools Association of Avon was formed with the responsibility for schools athletics within the four districts that made up the new county. The objects of the Association are the advancement of the moral and physical welfare and development of school pupils through the medium of athletics. Fundamental to this are the organisation of county schools track and field, cross country, combined events and sports hall championships and the selection of teams from these championships to go forward to the Regional (South West) and National Championships. The Association is affiliated to the English Schools Athletic Association and is run by a committee, comprising the offices of Chairman, Secretary, Treasurer and Team Managers plus representatives from each of the districts, which meets on a regular basis to conduct the affairs of the association. All schools and colleges within the four districts affiliate to the association on an annual basis. 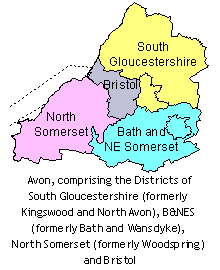 When the County of Avon was dissolved as a result of further local government changes the decision was taken to continue with the Avon Schools Association rather than the four new Unitary Authorities of Bristol, North Somerset, Bath and North-East Somerset (BANES) and South Gloucestershire affiliating separately to the English Schools Association or to become part of the Somerset or Gloucestershire county schools associations.